Today, customers compare their experiences with retailers and service providers across industries. New technologies, the accessibility of information, low switching costs — all these factors have risen the consumer standards. People tend to value more the service they get over the fact of buying and owning a certain product. And while the customer journey in the automotive industry is difficult to change fundamentally, it still can be made more effective and customer-friendly — through technology. In this article, we’ll explore what customers expect from auto dealers, from the car-buying process itself, what technological trends challenge automotive retailers, and how can retailers adapt to meet customer expectations. As retailers began implementing multichannel and omnichannel approaches to sell their products and services, and internet has become the major sales assistant for many consumers, the selling/buying processes of all kinds have utterly changed. However, not in all domains. In the automotive industry, customers have been following the same solid scheme for years: 1) research, 2) contacting the dealership 3) test drive, 4) making the final decision 5) closing the deal. And even with the introduction of e-commerce, being an auto retail customer is still a long process full of tough decisions and tiresome bureaucracy. Each step on the way to a car purchase can require great amounts of time and energy to accomplish. That’s why buyer’s look for other ways to buy a vehicle or even other ways of transportation. And while more recent studies (we’ll come to them later in the article) show that most of the consumers are willing to buy a car, there’s still a good share of people around the world who are turned away from visiting automotive dealerships. According to Deloitte’s 2014 research, the factors that affect the customers’ decisions on buying or leasing a car are affordability, maintenance costs, and availability of transporting services. Also, as many as 32 personal car purchases are avoided for every shared vehicle in 10 key car-sharing markets in the US. 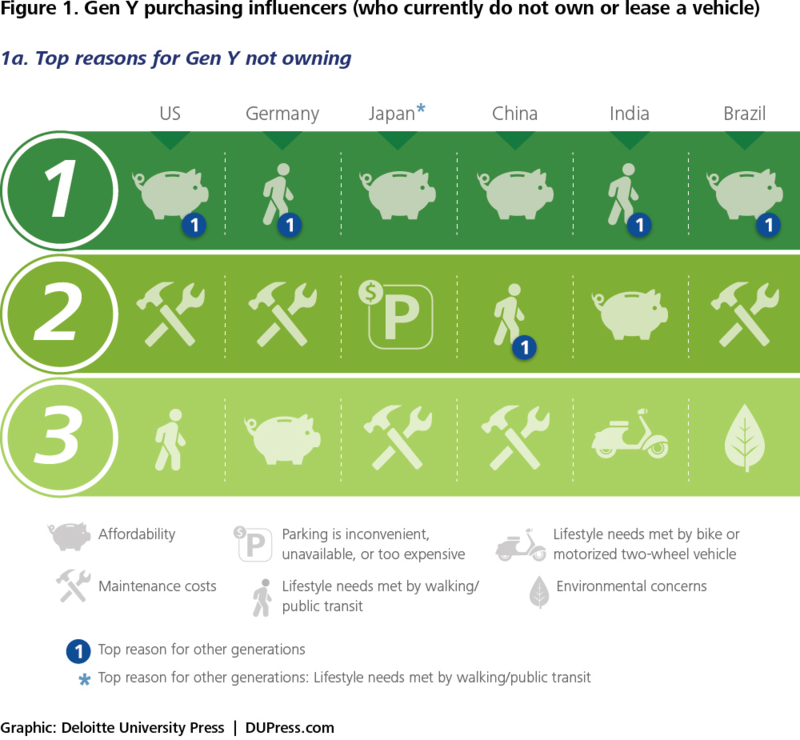 The infographic shows what holds Generation Y consumers (or Millennials) from buying a car the most. The common reasons are affordability, car maintenance costs, and the use other transportation services. For Japan, it’s also high car-parking rates. Today, the spending concerns aren’t the only reason why consumers — the younger generations especially — hesitate to get into a car owner shoes. With the emergence of new tech and shared economy trends, the new types of transportation services step into competition with classic vehicle owning and leasing. Millennials, the Generation Y, is now rapidly becoming the audience segment that influences all consumer industries, automotive including. This generation has the easiest access to information about any product or service, and they don’t have an urgent need to actually own a vehicle. Instead, they actively use the car- and ride-sharing services and other means of public transportation. To create experiences and services that will answer this demographic’s needs, automotive retailers and OEMs (original equipment manufacturers) should first figure out how to change their fixed business processes making a car-buying a quick and frustration-free journey. While mobility and the as-a-service concept gain more popularity in the world, especially among younger generations, there are even more retail and tech trends that now are going to the automotive industry too. Here are four major trends that can turn automotive into a software-driven service industry. Electrification. The shift toward hybrid-electric, electric, and fuel-cell technologies as these technologies become more accessible. Self-driven cars. Self-driving cars will advance to fully autonomous units. Mobility services. The popularity and accessibility of sharing economy are now changing customer preferences from buying or leasing to rentals and car sharing. Connectivity. The so-called “infotainment” solutions that engage people to buy a car or use a service. 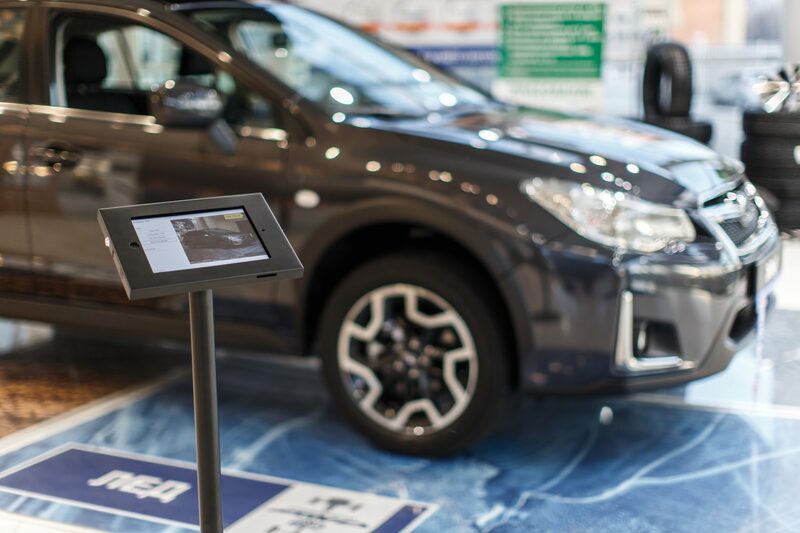 The connectivity trend, among other things, employs omnichannel marketing and the in-store solutions for automotive dealerships like digital signage and interactive kiosks. Knowing these trends, retailers and OEMs will be ready to reshape the market and business approaches to meet customer expectations and offer outstanding services and products. According to another McKinsey report, despite the good predictions for the future of mobility and e-hailing, global retail auto sales will continue to grow, albeit the growth rate is expected to drop from the 3.6% to 1.9–2.4% by 2030. The rise of new mobility services will come in dense areas with where the vehicle base has already formed. 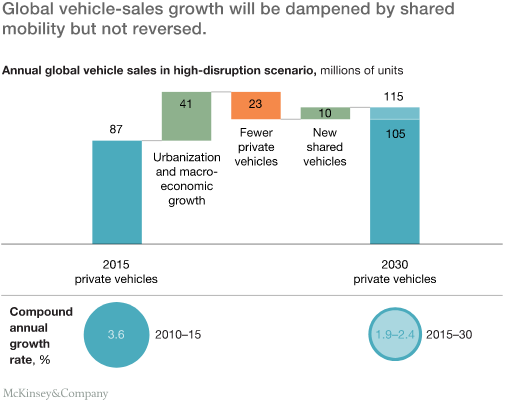 And while the shift toward shared mobility and e-hailing may result in a decline of private car sales, this decline won’t affect the car and auto parts retail sales, since the shared vehicles services will require fleet renovations. Also, there will always be those who prefer owning a car, but auto retailers will need to find new ways to meet the audience’s growing expectations. In this situation, what can automakers and dealers do to connect with consumers? Can they engage both those who aren’t interested in owning a vehicle and those who are ready to buy? Here’s what they can do. The abovementioned study by Deloitte also suggests that Generation Y drivers value customer experience three times as much as vehicle design. Unsatisfied with customer service in most dealerships and having access to a variety of information sources on the internet, customers prefer to make buying decisions based on an unbiased DIY research. 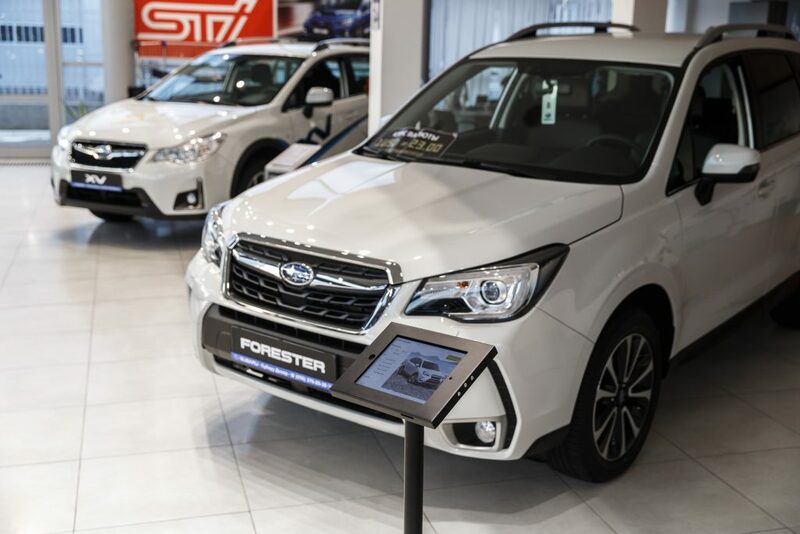 Retailers, in their turn, can provide their customers with all needed information in the format that attracts attention and allows to explore all products and services independently both in a physical dealership and via official online channels. While the online part is obvious, in-dealership solutions may be touch kiosks, interactive digital signage or other digital technologies able to provide engaging interactive experience and effectively inform customers and even help closing deals faster, excluding tiresome paperwork. To avoid customer frustrations during their experience with an auto brand, both OEMs and automotive dealers must fully integrate their digital and physical informational and shopping experiences. Omnichannel becomes a retail industry standard very quickly, and for the auto retail industry too. In order to build streamlined and adjustable omnichannel models, OEMs and dealers should improve their customer-facing and back-end technologies. This also will allow them to reduce retail spaces needed to showcase the models and accessories, so they and their customers won’t be limited by their auto dealerships locations making showrooms and pop-up locations anywhere from — shopping malls to specialized mini-stores. 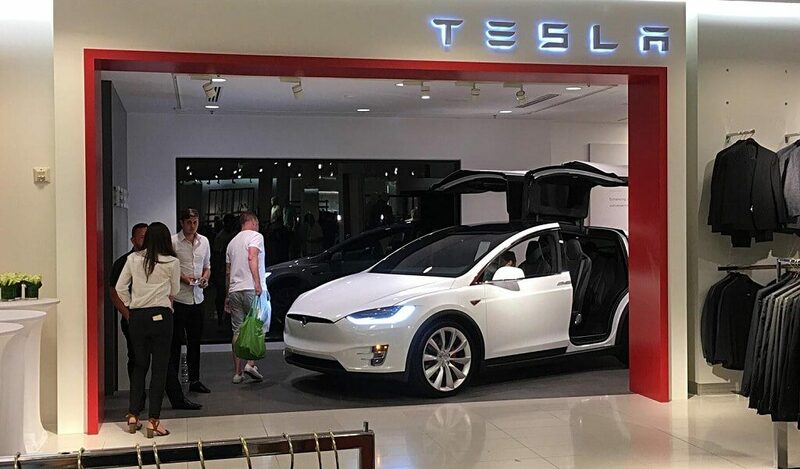 For example, Tesla already does that by allowing customers to purchase their Models online, while their stores work only as showrooms. Tesla’s example is a good case study for automakers how to reach their customers directly, avoiding dealerships. Auto dealers and OEMs should extend their reach and adapt to the changing market landscape by introducing new tech tools that improve their sales and marketing processes and meet the shifting customer needs. Touch kiosks and interactive screens are among such tools. They can help retailers bridge online and offline channels, engage dealership visitors and provide them with valuable information starting at product discovery and up to signing documents. A customer journey for car buyers is often a tiresome process, and that’s one of the reasons why audiences grow to turn away from visiting dealerships and buying cars.